A considerable amount of Black history in America has taken place in Boston. 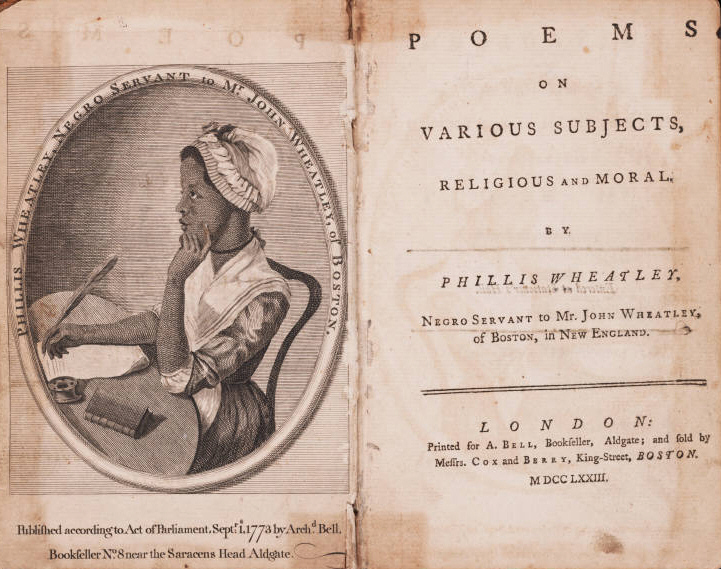 It was where Phillis Wheatley, a West African native—who emigrated stateside because she was sold as a slave—became the first Black female poet published in the U.S. It was once home to Malcolm X, who lived in Roxbury with his sister Ella Little-Collins. The capital can claim bragging rights to being the birthplace of the seminal Queen of Disco, Donna Summer. Here, are just three examples out of the motley of icons and brave individuals, and events, embedded in American history involving Black people, or African-Americans, with Bostonian ties. Surprisingly, one of the most Black-history rich spots in Massachusetts is in Mansfield, a somnolent suburb southwest of Boston. Loftily named The National Black Doll Museum of History & Culture, it is in its fifth year of using dolls, trinkets, and toys as a gateway to understanding the Black experience, encompassing centuries, subcultures, and generations. Doll emporiums, such as Wenham Museum, also in Massachusetts, and conventions are treasured by enthusiasts. Showcases on Black and ethnic dolls are quite common within mainstream and general art museums. But such showcases are usually not extended into permanent exhibitions. For a year-round education, The Philadelphia Doll Museum was the harbinger for over a decade, regaling itself as the “only museum” preserving and collecting Black dolls. Debra Britt, Executive Director and Founder of The National Black Doll Museum of History & Culture (NBDM), joined the cause of exploring the Black doll’s valiant presence when she opened her own museum to the public in 2012. A warm reception followed as news and small papers from nearby Connecticut and Rhode Island were fond of the museum’s mission. The Boston Globe showed admiration in their write-up as well (and they did so again, late last month) as its metropolitan namesake is 20-25 minutes away from Mansfield if you take the commuter rail from South Station. (A Dorchester native, Britt worked for 21 years at the South Station post office). The NBDM is first on a block of one-story, low-ceiling buildings on 288 North Main Street, and appears as homely on the outside as neighboring Looking Glass Café. Not until encountering the up-close appearance of a slightly pixilated banner of a brown skin porcelain doll with big, hopeful amber brown eyes do NBDM visitors know they have arrived. Past the gift shop, where you pay admission, the bombardment of Barack Obama’s legacy first nets your attention. Encouraging quotes such as “To be Black was to be the beneficiary of a great inheritance, a special destiny, glorious burdens that only we were strong enough to bear”, an excerpt from his 1995 memoir, Dreams from My Father, are scotch taped on locker cubbies. On the opposite wall, newspaper clippings, including headlines from his two historic election night victories, hang proudly. The sisters did not intend on opening a functioning doll museum. Once they found and occupied 288 North Main, it was meant to be storage for their massive collection. “It was just a place to count the dolls.” Her collection at that point had overflowed in her household. “We have 6, 275 dolls. We don’t put them all out at the same. That would just be too much!” (In comparison, The Philadelphia Doll Museum has stated it obtains 300-500 dolls in its collection). Museum decor is often achieved with major aplomb. No fancy display or staircase unturned amongst the Manets, Monets, and Egyptian sculptures. But at the humble NBDM, it is a museum in the classic sense of the dolls in a collective space. You just feel as if you are a guest at a family reunion, witnessing the family tree from room to room, versus simply gleaning artifacts. The dolls unfold stories of the past instead of sepia, cream and gray, or black and white Polaroids. And while Britt attempted to spare guests by not having every doll on display (capacity wouldn’t permit it anyway), the museum remains fraught. The first room acts as a prelude to the eight NBDM galleries. Ndebele dolls greet with their black skin made out of pure cloth or tights, and gold-banded necks, as stark, beaded eyes penetrate from their gourd-shaped bodies. Next to them are dolls in traditional African garb, and inside a standing cupboard, a 1919 doll made with a wishbone that can be held in the palm of your hand. The oldest dolls and toys in the NBDM are from 1789 in a glass case. They are as small as two ants put together. Britt officially begins her tour with the Dogon Tribe hut. This section includes a surprise spot where 720 dolls are contained for a historic jolt. “Black firsts” within politics, women’s rights, and inventors are in the next room. Amongst uber-famous activists and rebels like Dr. Martin Luther King, Jr. and Rosa Parks are detailed histories of lesser-known heroines like Mary Elizabeth Bowser (“Elizabeth Bond”), a Union Spy against the Confederate with astounding photographic memory. “She was never caught” Britt disclosed. This room doesn’t have any dolls. The purpose is clear and direct: know your history or the history of the unsung. The following space are a handful of baby dolls on shelves. Their doughy eyes and puffed out cheeks melt hearts and widen eyes. They are extremely cute. 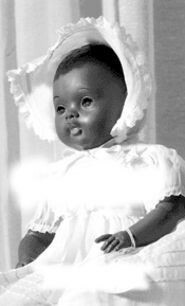 In particular, the cherubic ”Saralee” was a baby doll created by Sara Lee Creech, a White woman who sought to make Black dolls available and more realistic for Black children of the 1950s. Across from Saralee rests an original Cream of Wheat doll of the brand’s Black chef mascot. Derogatorily nicknamed “Rastus”, his name likely came from one of the characters, a deacon, in the questionable Black folklore of the Uncle Remus stories, authored by White Georgian Joel Chandler Harris in the early 1880s. Next to it is the equally, and still in its box, the controversial Nabisco and Mattel collab, the “Oreo” Black Barbie doll that was released in American toy stores in 1997. 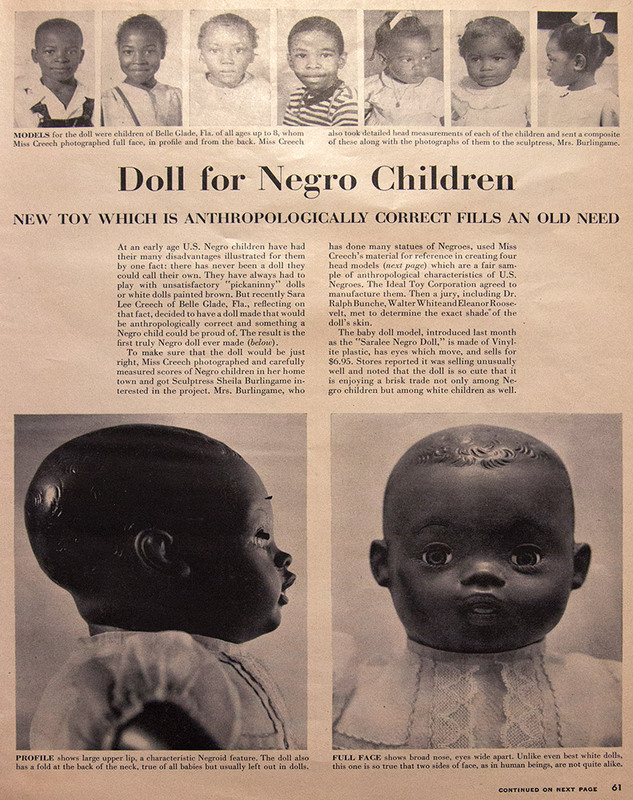 As a counterpart to the White “Oreo” Barbie, heated conversations from the Black community, because of the double-meaning jargon of “oreo”, reached Mattel’s headquarters, prompting the doll to be pulled. Before heading into the next gallery, of 1960s to early 2000s entrepreneurs, Britt can’t help but dispense information on almost every other doll or item her eyes graze. She pulls out doll parts from inside a clear jar and explains that they were dyed cocoa brown and assembled back together for Black children to play with, in the 1920s. Historical context is pivotal to the NBDM but a lot of fun is shared too. The music room is light-hearted, with vinyl records on the walls featuring classic soul, funk, and R&B of the 1960s to 1980s. They are dolls resembling Destiny’s Child, Scary Spice of The Spice Girls, Tupac Shakur, The Notorious B.I.G., and a 1991 MC Hammer doll, donning the rapper’s unforgettable gold harem pants and matching bolero jacket. The Michael Jackson doll is downstairs in inventory, but the Bob Marley that “people come from all over to see” is always there. It is one-of-one of the reggae legend—with a jubilant expression in face and body—because his hair and clothes were co-signed by his mother, Cedella Booker. Britt had met Johnston at a doll conference. Booker passed away in 2008. There is a sports room, a wall dedicated to Native American dolls, started by one of Britt’s sisters, and of course, a Barbie room. 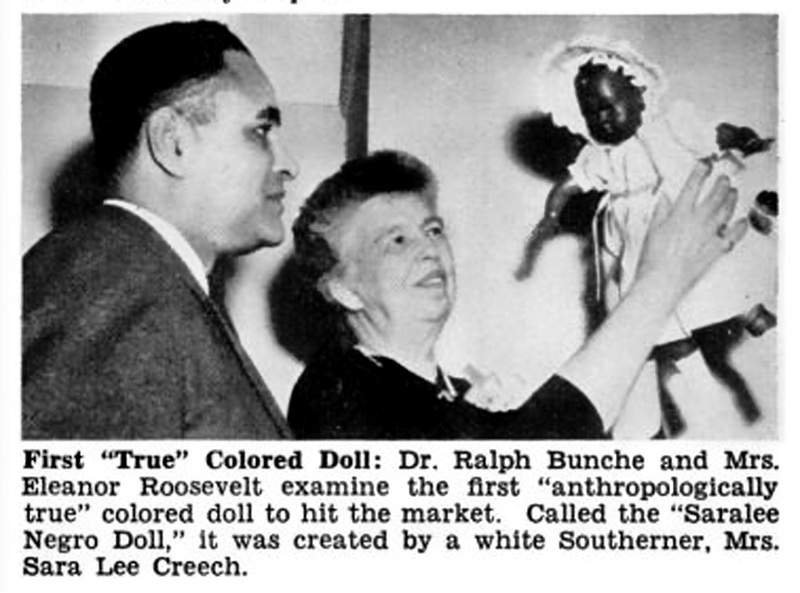 The one doll missing from the NBDM archive is Addy, the first ethnic/of color doll issued by the American Girl brand. Britt wasn’t sure why that was. It may have just been an oversight. What’s collected so far certainly makes up for it. She will also host an exhibit, courtesy of the Smithsonian Institute Traveling Exhibition Service, called “A Place for All People”, a similar take on inclusivity and diversity. While leaving the Barbie room, Britt mentioned owning a thousand versions of the famous fashion doll. Though she acknowledged throughout the tour that she’s been a collector since her 1950s youth, after all these years, she still wouldn’t categorize her gravitation to dolls as simply fanatical. “I don’t know if it was passion more than it was rebellion that led me to the dolls,” she says with ease while heading towards the wall of Black action figures, the last of the eight galleries.